Having pitted River Song (Alex Kingston) in her “standalone” series against the so-called “Rulers of the Universe”, the Speravore hive, and most recently Madame Kovarian and the Furies (not to mention earlier incarnations of her husband), Big Finish has upped the stakes for the maverick archaeologist with a new, seemingly invincible villain.The Discordia are, according to one of their number, an anarchical time travelling race which filled the power vacuum in the aftermath of the Time War. Unlike the Time Lords or even the Daleks, the Discordia have absolutely no regard for the integrity of the space/time continuum, using their temporal powers to conquer their enemies and even absorb their strengths through a “widening of the gene pool”. Woolgar’s Jemima is the perfect foil to Kingston’s River. It is refreshing to see River bested by a peer in archaeology. While River is by far the cockier and more self-assured of the two archaeologists, Jemima is shrewd and calculating beneath all her fussiness, bluster and insecurity.There’s also a sense (as Woolgar perfectly conveys) that Jemima resents River’s academic feats, glamorous demeanour, and constant swagger. What is perhaps less convincing about Jemima is her sudden change of heart and selflessness at the conclusion to the tale; it just doesn’t ring true, given she has partially set up the story’s chain of events in the first place. The second serial Kings of Infinite Space (a title inspired by a quote in Shakespeare’s Hamlet) is quite literally a “run-around” tale – with River and her newfound companions on the run from the vengeful Melak (George Asprey) – and as a result it’s not necessarily all that effective for it. Donald McLeary’s script is the weakest entry in this set – it feels like a retread of the 1965 Doctor Who serial The Chase (and indeed that adventure is acknowledged as an inspiration in the CD extras). River and her friends visit a range of strange times and places before there is a showdown in a deserted colony whose robot caretakers have been waiting thousands of years for humans to arrive (shades of the Mechanoids, anyone?). The episode still has some memorable highlights, though, as Alex Kingston excels herself in dual roles – as River and a River android duplicate (which considers itself a few “percentiles sexier” than the original!). The android proves to be the perfect foil for Melak, and often gets the best dialogue and wisecracks – even better than River herself! Special mention also goes to performer Ewan Bailey who employs a wide range of voices and accents to portray a string of hapless and villainous characters (his Rattis is simultaneously flamboyant and creepy). The third instalment Whodunnit? also provides plenty of scope for Kingston to test her range. Once more adopting her private detective guise of Melody Malone, River is thrust into a murder mystery scenario reminiscent of the game Clue, in which a group of amateur sleuths and professional detectives are being murdered one by one on an estate. To add to the intrigue, legendary author Franz Kafka (Tim Bentinck) provides counsel for our heroine as she singlehandedly attempts to solve the mystery. Whodunnit? is naturally a homage to the detective and crime noir genre, with the supporting characters very clearly based on other fictional investigators, eg Hercule Poirot, Sherlock Holmes, Father Brown, Lord Peter Wimsey, Doctor Who’s own Madame Vastra and Jenny Flint, and even Scooby-Doo! However, it’s also very Kafka-esque in its execution, with many concepts in the tale inspired by Kafka’s great works, including The Metamorphosis, The Trial and The Castle. This peculiar blending of genres and sub-genres would be just plain confusing in less accomplished writing hands than the boxset’s script editor Matt Fitton but makes complete sense once River truly begins to appreciate the gravity of her situation. The curiously titled Someone I Once Knew closes out the set, with Tom Baker’s Doctor completing River’s tour of all the surviving classic TV series Doctors in what are supposed to be her “solo” adventures. Scribe John Dorney, however, mischievously turns the concept of River meeting her husband’s incarnations in reverse order on its head. On TV and in some of BF’s audio adventures, River is armed with plenty of future knowledge about the Doctor’s adventures; the further back she ventures down his time stream, the less knowledgeable he is about her. However, in this meeting, it’s the Doctor that is apparently armed with foreknowledge about his wife, particularly of events that she either hasn’t experienced or which lie in her personal future. The Doctor: What was that thing you used to disable General Dante’s gun? I don’t approve of guns! River: It wasn’t a gun – it was my sonic trowel! The Doctor: A what? A trowel? Why you little Gertrude Jekyll, you, I didn’t notice you doing any gardening! River: It’s a variation on your screwdriver! The Doctor: In what way? My screwdriver is just a screwdriver! River: At the moment it is! Let’s just say you go crazy with the optional upgrades! Look, can we save the marital for later on? I think we need to get away! The Doctor: You’re probably right! Here we go – on the run, together, almost like old times! River: Oh, new old times for me! The Doctor: I’m delighted to be with you. There’s no where I’d rather be. Just the two of us – together as disaster swamps the universe! The Doctor: Oh, don’t lie! You adore it! My major criticism of this set – which has little to do with the largely first-rate storytelling – is the actual voices of the Discordia. Generally, BF’s sound production values are excellent, regardless of the content. However, in a bid to make the Discordia sound powerful or frightening (or both), the chief antagonists’ voices have been so treated electronically that they sound like deep, almost unintelligible David Banks-style Cyberleaders – even though (considering all of the adaptations they will have made to their physiology through their conquest of time) there is no indication that all of the Discordia are cybernetically augmented. By comparison, the voices of the other aliens that feature throughout the set are untreated. Adele Lynch’s Gammarae and even Fenella Woolgar’s Formidian Queen in Time in a Bottle portray the giant ant-like creatures with largely natural voices – but the two actors give their characters clipped, brisk tones (in manners that are meant to reflect the swift thinking of giant ants). In fact, Woolgar’s performance as the Queen is so different from her major role as Jemima Still that you don’t realise until the end credits that she in fact plays two characters. Josh Bolt’s Spod has a treated electronic voice but it is also in a subtler vocal range than the Discordia. Some of the minor alien characters encountered in Kings of Infinite Space and Someone I Once Knew also speak in more natural, largely untreated tones than the Discordia. It implies that to make the “big bad” of this set seem so intimidating, the sound designers felt treating the voices would be effective (which hardly works when we meet plenty of dim-witted and obsequious Discordia!). Yet it is clear from my experience of watching and listening to a lot of SF over the years that it’s sometimes better to just let the actors’ natural voices prevail. I also query why in the overall story arc the keynote villain is chopped and changed at the halfway mark. The Discordia are essentially personified by Sub-Captain Melak and General Dante who are so very similar in persona as to be the same character. Indeed, the enthusiasm of one of the villains for River would be more logical, convincing and interesting if he was the other antagonist (who at least shares a real, not contrived, history with River). But given neither adversary would have coped well with rebuttal, it’s debatable whether the saga would have played out any differently. 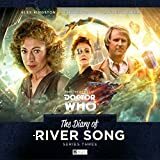 Series 4 of The Diary of River Song is an entertaining addition to River’s audio adventures and works all the better for limiting past Doctors’ involvement in the overall narrative (which has not been the case in some of the earlier sets, notably Series 2). We get to see River in charge of her own expedition, racing through time and space with two non-human companions and a vortex manipulator, and besting herself against the wild imagination of Franz Kafka. Much like Doctor Who more broadly, River’s adventures are certainly not bereft of imagination. However, it would still be interesting to hear more of River’s exploits as an archaeologist (even after four volumes there have only been hints) rather than bogging her down in the continuity of meeting her husband in reverse order and multiple incarnations of the Master/Missy in the forthcoming Series 5 boxset. Alex Kingston (River Song), Frances Barber (Madame Kovarian), Peter Davison (The Doctor), Ian Conningham (Kevin / Rindle), Julia Hills (Sharon / Rindle), David Seddon (Mr Quisling / Tarn 2), Leighton Pugh (Lake 2 / Dave / Tarn), Sophia Carr-Gomm (Lily), Joanna Horton (Brooke), Issy Van Randwyck (Giulia), Rosanna Miles (Antoinette / Maid / Constanze), Teddy Kempner (Viktor / Mozart / Stefan / Apothecary), Jonathan Coote (Maitre D' / Chef / Assassin), Nina Toussaint-White (Brooke 2), Francesca Zoutewelle (H-One / H-Two / Mission Captain), Pippa Bennett-Warner (O / The Deterrent). Other parts played by members of the cast. When Big Finish began their River Song series, I was initially quite excited. I had really warmed to the character, and so the idea of her living on for further adventures on audio, at a company that consistently releases entertaining stuff, thrilled me, to say the least. But the first boxset actually left me quite indifferent to the idea of even listening to more. It wasn't bad, and it had Paul McGann in it...but it felt like it was missing something. In preparation for this review, I decided to give the second boxset a whirl, just in case it had some lingering plot thread I might need to fully understand this newest set...and I found myself enjoying it a lot more than I had the first set. Maybe it was better plotting, a more engaging story, or if it was just the timey wimey Doctor crossings featuring both the Sixth and Seventh Doctors in the tales...but whatever it was I felt was missing from that first set, seemed rectified by Series 2. Some SPOILERS may be ahead, as it would be somewhat impossible to talk about certain episodes without discussing plot revelations in earlier episodes. Reader Beware! So we come to this third box set of River Song adventures, and from the word go it is quite exciting. The opening story, The Lady of the Lake is slightly intertwined with the Eleventh Doctor story A Good Man Goes To War, which was the episode that finally revealed just who River was. We find out here that River wasn't the only thing Madame Kovarian experimented on at Demon's Run, they also took River's DNA and created seven other Time Lord hybrid babies...basically River's own brothers and sisters...and she has to stop one of them that has gone a bit mad due to the mysteries of his regenerative nature. It's an exciting opener, with lots of wonderful bits, character moments, and a tremendous pace. The second story has the River playing companion to the Fifth Doctor, along with a previously unknown companion known as Brooke. They land in Vienna in the 18th Century and end up on the trail of murders and mystery...as things so often tend to go when you travel anywhere or anywhen with the Doctor. It is basically a solid Fifth Doctor story, from the point of view of River Song. The big reveal of this episode is that Brooke is not who she says she is when in the end she attempts to kill the Doctor. using the same means as the murders of the episode. River is able to save the Doctor, the question remains what to do with Brooke, and just who is she?. It is quite clear that the River Song series is taking it’s time travel shenanigans and story structures from the Eleventh Doctor era, and that is probably most evident in the third story in the set, My Dinner With Andrew which plays with time travel and hopping around more than most. it is a quite entertaining, though just like the Eleventh Doctor era it moves fast and sometimes needs a bit of relistening in order to get the full picture of what is going on. I rather liked this one, but I did find a few things hard to keep track of...such as which River is which, but ultimately it is a fun story with good performances from Kingston, Davison, and co. The story also brings back Madame Kovarian, and reveals that Brooke is, in fact, another DNA clone of River hoping to succeed in killing the Doctor...which she does, only his Fifth Incarnation. The final episode of the set reveals that there are several other clones of River still alive, with Brooke being the favorite. Kovorian's plan seemingly succeeded, but killing the Doctor so early in his time stream has catastrophic results for her. She begins to see ghosts and then becomes the target of a new radical faction that wants to destroy her, for just as her plan to kill the Doctor was meant to stop him from destroying the Universe, her killing of him ends up doing just that, so now she is seen as the cause of the Universe ending. The episode is really, at its heart though, about River and her sisters. Brooke has a taste for killing now, even killing one of her own sisters, and the sisters are all completely warped by Kovarian, can River somehow get them to come around against Kovarian and maybe undo the killing of the Doctor and thus save the universe? SPOILERS...the Doctor lives. This should be surprising to no one that they haven't killed the Doctor off in his Fifth incarnation, the means about how he is saved is where the story is interesting though, and that I will not spoil. This is a good box set, with a story and structure that heavily ties into the Eleventh Doctor's era of stories, any fan that enjoyed the time hopping and intricate plotting (and even major plot elements) that shaped that era of the series will probably find something to enjoy in this set.